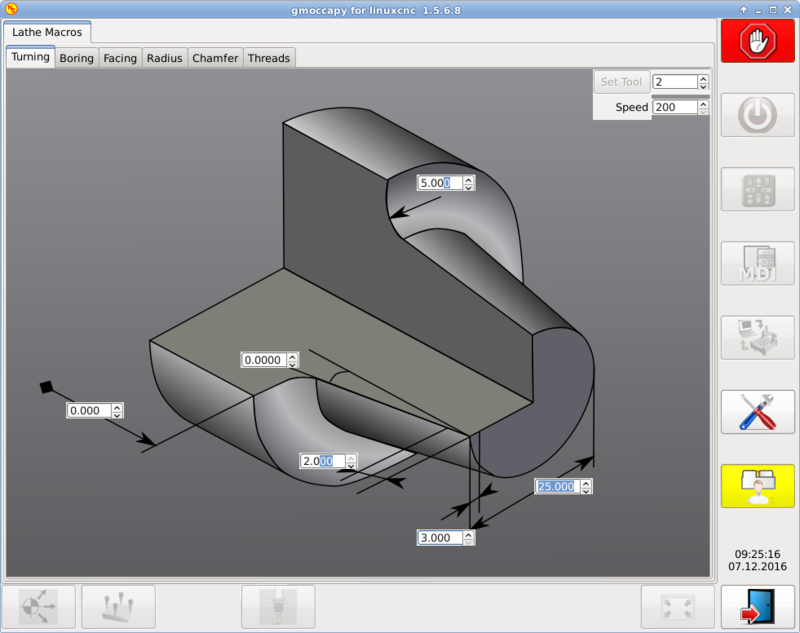 Is there anyway I can display both the Cycles tab and have the Spindle rpm tab displayed on the right axis screen? I can get one or the other to display but not both. # _DO NOT_ include your HAL commands here. Last edit: 27 Aug 2016 23:52 by OT-CNC. You seem to have a lot of commented-out lines there. Perhaps that is why they don't work? That is what I had to comment out to get cycles to display. If I don't comment out GLADEVCP = -H gvcp_call_list.hal gvcp-panel.ui and what's in the gvcp_option.hal then the cycles tab is embedded but doesn't show any of the contents. How do I display both? 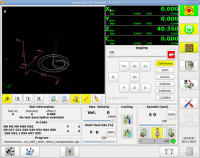 OT-CNC wrote: How do I display both? I don't know for sure that you can. You could try changing the loading order of the things and making them wait for completion. 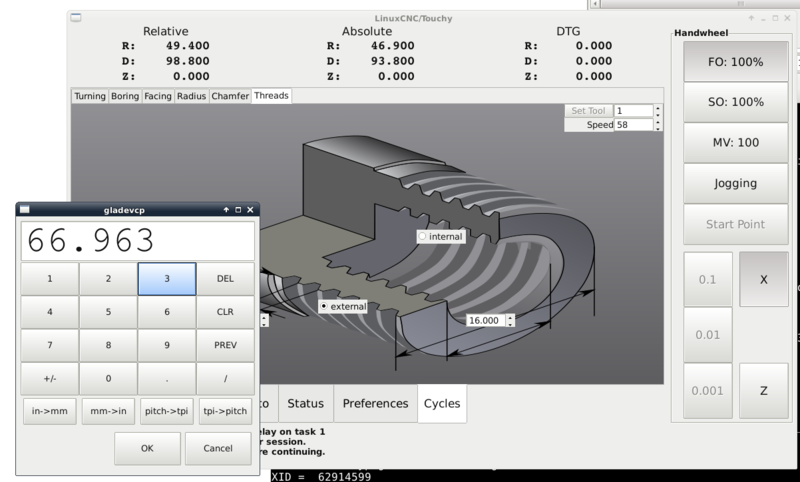 As my new lathe has a touchscreen (and is using "Touchy" as the interface) I have re-worked my macro interface. Because Touchy always shows the DRO I have removed the DRO from the embedded tabs. Touchy uses a physical cycle-start button, so I have added a HAL pin to the embedded tabs and hidden the buttons on the tabs (the action buttons are still where the G-code calls are stored, the physical button is made to emit a click event). If anyone wants the touch-buttons then it should only be a case of making the buttons visible. This might mean adding a parent window such as an event box. Last edit: 13 Nov 2016 18:33 by andypugh. That looks great, Andy. I'd love to see a live demo on YouTube showing how it all works together. I've been avoiding Touchy as less standard than Axis, but I might need to give this a try. This looks to be exactly what I am looking for on my lathe. I am using gmoccapy though and when I install the touch version there are no svg graphics visible on the tabs. I see the settings values in the right places but no graphics. The numeric entry pop-up also doesn't show up when I tap on one of the values. I have to specify the EMBED_TAB_LOCATION or the tab will not show up. The non-touch version seems to work but I was hoping to get the touch one running. Any suggestions would be greatly appreciated. solved the problem of the grafics to me. But I have no play button any more! And If I enter a speed value of 350 I got 200 in the entry, similar in other entries, entering a value of 100 gives 3.000 etc. May be a inch metric behavior. I am using SI units so I am in metric! Attached my sim INI folder for gmoccapy. P.S. Andy the readme seems to be out of date. Last edit: 07 Dec 2016 08:32 by newbynobi. newbynobi wrote: But I have no play button any more! I deliberately removed that for Touchy because Touchy uses a physical button for cycle-start. The "Play" buttons are still there, and can be made visible by editing the .ui file (probably with a text-editor rather than risking Glade messing up the formatting). I think searching for the string "Action" will find them. No, I always work in metric too, so it isn't that. You might need to change the upper limits of the "adjustments" of the spinboxes. But: 350m/min is a very high surface speed, I don't think I ever go above 120. After some use I have noticed that the fact that the entry-widget initialises with the old value is very annoying, and I need to change that.